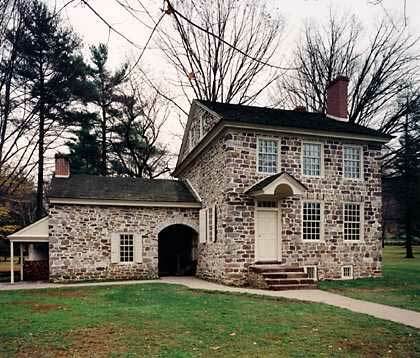 Washington’s Headquarters at Valley Forge, where Washington foresaw the Civil War. At first blush, anything to do with George Washington may seem to have little connection with the Civil War. Yet there is more than one incident in which Washington, or some spectral entity resembling him, influenced the outcome of events relating to the Late Unpleasantness. In this first entry about George Washington and the Civil War, we will look at an obscure incident from the American Revolution which uncannily fore- shadows, not only the Civil War, but perhaps both world wars as well. For a fuller account about Washington and the Civil War, however, I refer you to Chapter 16 of Ghosts and Haunts of the Civil War. One of he early publications of Washington’s Vision. Let us go back to the winter of 1777, the “year of the three sevens” and the time when the Revolution almost collapsed. It was a starving time for Washington’s army at Valley Forge: the troops were ill fed, ill clothed and freezing in their hovels. The Continental Congress, as Congress does today, did nothing to help. The troops were not being paid and on the verge of mutiny. It against this background that Washington’s prophetic vision at Valley Forge should be understood. Our sole source for this incident was a soldier named Anthony Sherman. His account was first published in the 1840’s in an obscure journal now unobtainable. Fortunately, his account was reprinted after the Civil War in the National Tribune, a newspaper published for the benefit of Union veterans, mainly to enable them to get pensions from the Federal Government. As with the VA today, veterans were often frustrated dealing with the government they had defended and fought, died or were disabled protecting. His account, having been told well before the Civil War, gains additional credibility thereby. Sherman (no relation to the general) was an ordinary soldier, posted to Washington’s headquarters at Valley Forge at the time. One day, General Washington emerged from his private quarters, where he had been alone for some time. Emerging visibly shaken, he began to relate what he had experienced to a trusted aide (Sherman does not say whom, but it was likely Alexander Hamilton). Sherman was close enough to the two to hear what Washington said, and what the general had to say remained seared in Sherman’s memory. What he allegedly heard (he was in his nineties when related it to a reporter, who apparently embellished on the tale a bit) was that Washington, alone at the time, was in his office praying. Washington was not an overly religious, being a product of the enlightenment, when most educated gentlemen regarded God (if they regarded him at all) as a sort of divine “clock-maker” who wound up the universe and then stood back and watched it move on its own. However, the winter of 1777-78 was “the time that tries men’s souls” and that winter Washington if fact prayed quite a bit for divine guidance. On this occasion, it seems, his prayers were answered–perhaps. Washington’s office at Valley Forge, where a “singularly beautiful being” appeared to him. 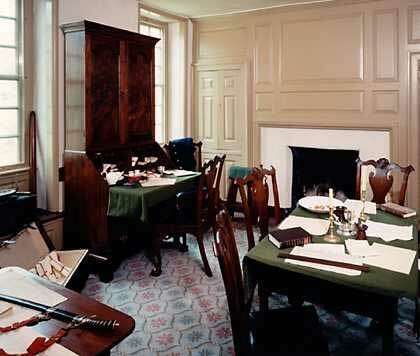 Washington was in his office, alone, when he became aware of a presence in the room. It was, “a singularly beautiful being,” with whom the general tried to communicate. After he addressed the figure several times, she finally responded. The room’s walls seemed to disappear and his surroundings became luminous. ‘Son of the Republic, look and learn,’ she said to Washington, and then spread out her hand in a sweeping gesture several times. Each time an angelic being dipped water from the ocean and cast it over the continents of Europe, America, Asia and Africa. On the third such cast “from Africa I saw an ill-omened specter approach our land,” Sherman heard Washington say. There followed visions of war and destruction, the blasting of trumpets and other scenes which seemed to presage war and ultimate victory. Clearly, at least part of this version related to the Civil War. This was, at least, how the reporter interpreted it. Not surprisingly, ever since this account was first published, there have been professional debunkers ever eager to disprove its veracity. One industrious researcher located the records of a young officer of the Revolution and triumphantly announced the story a fake, because the Anthony Sherman in question had been at Saratoga and not at Valley Forge. Of course, debunkers always go for pat answers and the fact that there very well may have been more than one soldier named Sherman in service during the American Revolution never entered his closed mind. When dealing with prophecy of any sort, we are always dealing with a two edged sword; they are generally committed to paper years after the events have come true and when based on only one reporter’s account it is easy enough to discount. Moreover, prophecies are rarely clear declarative statements: they are more often clothed in vivid imagery and language capable of multiple meanings. In this case, while another version of the prophecy seems to have been previously published well before the war, that original publication, like many early American periodicals, has not survived. The earliest extant publication is by the erstwhile Philadelphia journalist and dates to the eve of the Civil War, when many such prophecies about the onset of war were in the air. This is as far as most previous researchers are willing to relate of Washington’s vision. But in fact, the account as published on the eve of war related far more than just the onset of the Civil War. For one thing, “the singularly beautiful being” also says to Washington, ‘Son of the Republic, the end of the century cometh; look and learn.’ If this were just propaganda meant for the northern public on the eve of Civil War, why would it refer to future generations? While the first conflict she mentions is easily dismissed as the Civil War, the second and third are not. While one can put whatever spin on them one wants, it takes no Nostradamus to interpret the second and third “perils” as the two world wars, and the third conflict in particular as World War II, which was indeed the “greatest conflict” and where indeed for a time it seemed the Axis Powers would take over the “whole world.” The professional debunkers of this prophecy conveniently leave out these parts of the prophecy, which clearly do not fit their smug theories and which, if they do not “prove” it, certainly give the story greater credibility to the modern reader. As to the “singularly beautiful being,” several theories have been proposed as to who she was: some say the apparition was the Virgin Mary, who has been known to appear and deliver prophecies in that manner; more recently, the show Ancient Aliens theorized that she was an Alien (of course). The 1859 version makes no such assertions, so the reader is left to add their speculations to the others. Of course, as with any prophecy, one is free to believe or disbelieve, or to interpret it as one wishes. As for me, I believe. For more uncanny tales of the Civil War and the South, see Dixie Spirits and Ghosts and Haunts of the Civil War.